Moisture rises into the low pressure system as it spins through the Central Pacific. The jet stream tracks east across the Sierra Nevada, clouds rolling across the Great Basin and piling into Utah's Wasatch Range. Moisture wraps to the south, the gyro cell covering parts of nine states and Mexico, pulling moisture from the Sea of Cortez before charging through the Four Corners to the nation's highest barrier: the San Juan Mountains of Southwest Colorado. 1) Fly fishing is not a sport of necessities. It is a sport of preferences, opinions, credos and mystique. There are no right and wrong choices. If a fly rod does not make you happy, choose another fly rod. Profound inspiration comes from peaking over the horizon, catching a glimpse of another world, a light brush with a former dream that becomes recurring. After a 12-year hiatus, Telluride Outside is back in the snowmobile tour guiding business. This spring, Telluride Outside acquired the snowmobiling portion of Dave's Mountain Tours, a guide service that has operated near Telluride for about 15 years. Beginning in late November 2012, Telluride Outside will offer daily tours in the spectacular Beaver Park area, just 30 minutes from Telluride. Strong fishing reports have rolled in from all around the region this week. In the south, the San Juan has enjoyed one of its best winters in many years. The State of New Mexico did some heavy streambed improvement above the Texas Hole, resulting in much improved structure for upper river wade fishermen. This has drawn crowds, but the San Juan always draws crowds. Check it out on a weekday! Nymphing has been more productive than dry fly fishing (no surprise, in the winter), with micro-sized midge and BWO patterns leading the way. 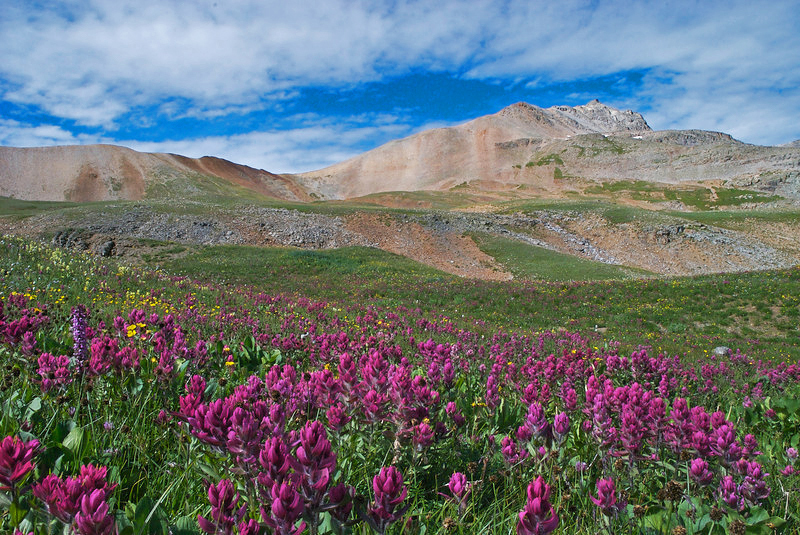 A late spring and heavy July rains have produced an epic wildflower season in the mountains above Telluride. To the benefit of both 4-WD tours and photography tours, you'll never see the high country more beautiful than it is right now. Get up there! More than 20 species of flowers are in full bloom! August 5 The longest rafting season since 1997 will end this morning as our paddlers make one final lap on the Specie Creek-Beaver Creek section of the San Miguel River. Thanks to everyone who joined us for some whitewater this summer! Viva whitewater! Intermittent rains have sustained the San Miguel in the rafting zone through July. We are pleased to offer raft trips in August for the first time in fourteen years! Rain is in the forecast for the next week, so expect rafting to last through the first ten days of August. Grab a paddle and join us for a half day rafting trip on the San Miguel River!